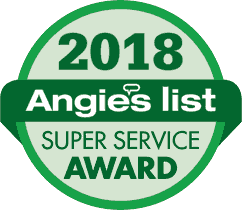 This award is given to companies in Wilmington DE that have achieved and maintained a superior service record on Angie’s List. Requirements include maintaining an “A” rating, receiving a high volume of positive reviews, and never failing to respond to member problems. Only 5% of Angie’s List companies qualify for this prestigious award. We thank our customers for awarding us the Super Service Award for the third consecutive year. Read more about the award. Providing worry free removal of your problem tree. Increase your tree’s beauty and prolong its life. Our Arborist will evaluate your tree at no cost. Learn what can be removed safely and when. No ruts, debris, or damage is our procedure and promise. We provide large tree removal with comprehensive aftercare. Brandywine Tree and Shrub is dedicated to serving the Wilmington Delaware Metro and surrounding areas. We have built a solid reputation for superior tree service near you by providing great value to our customers. While respecting your needs and exercising our skills, we care for trees and shrubs on your property careful not to disturb neighboring areas. Backed by years of training and experience, Brandywine Tree and Shrub employs talented, dedicated arborists in Wilmington Delaware and throughout our service areas. With extensive knowledge of the area foliage and weather conditions, we ensure proper care of existing plants and mature trees. We maintain the health, safety, and beauty of your commercial or residential landscaping with trusted expert tree care nearby. Call (302) 475-7594 to schedule a worry-free estimate today. Our experienced, friendly staff takes great pride in both the work and the service we provide. We treat every property and plant entrusted to us as if it were our own. We listen to your concerns and take a look at your property to carefully assess what is needed to preserve and maintain your landscaping. No job is too big or too small! We provide the best level of tree and shrub maintenance in the Wilmington Delaware metro area to both residential, commercial landscaping customers. Commercial property tree removal is completed in a safe and timely manner to minimize disruptions at your business. Residential tree removal is carefully planned to ensure no property is damaged while trimming or removing trees. We have all the necessary equipment to ensure we do not cause damage to your gardens, hardscaping, or your lawn while we complete your services. We leave the area clean and trees beautifully maintained. 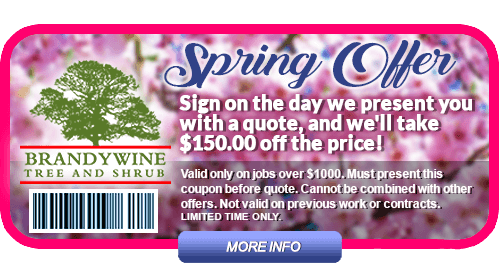 For expert tree service near you, call Brandywine Tree and Shrub at (302) 475-7594 to schedule a free evaluation today. When hiring your tree surgeon in Wilmington, Delaware, contact a Brandywine Tree and Shrub team member today at (302) 475-7594 to discuss the scope of your project. Knowing more about your goals and concerns will help us accurately determine the best course of maintenance to keep your property beautiful. Why Brandywine Tree and Shrub Does NOT Offer Tree Topping in Wilmington Delaware and surrounding areas. The arborists at Brandywine Tree and Shrub are experts in tree care and maintenance of all plants native to the areas we serve. Our goal is to help you keep your residence or commercial landscape beautiful by nurturing the trees on your property. Our experts practice extreme care and know that tree topping is harmful to your trees. Over the long term, this becomes more costly to the property owner by weakening the tree over time. Your once healthy tree will grow vertical shoots with weak branch connection, causing them to fall. This requires more frequent pruning and clean up costs. If you are looking for a quote on tree removal or tree care in Wilmington Delaware and are unsure if we service your area, call our helpful staff at (302)-475-7594. Our outstanding reputation and focus on customer satisfaction have allowed us to grow into new areas that may not be listed here. We believe in providing you with upfront and honest assessments with no pressure. Contact us here (Link to contact form) to schedule your no-obligation estimate today! Is Reliable Tree Removal in Wilmington Delaware Affordable? Arborists at Brandywine Tree and shrub are experts in the field. We have extensive knowledge of tree health assessment and will diagnose the condition of your trees. The best treatment for the condition of your landscaping — to restore the health and safety of the vegetation on your property — is skillfully and efficiently determined with your budget and proper tree care in mind. Our years of experience have shown us that every project is different. At Brandywine Tree and Shrub, we feel it’s important to visit your tree removal site in Wilmington Delaware and surrounding service areas to assess all your commercial and residential landscaping needs. We can then give you a more accurate idea of tree removal costs, or storm clean up assessment. Upon visiting your commercial or residential property to determine what is needed, and you will be given a quote on the same day. Following are factors in determining the cost of tree care, or may impact the cost of tree removal. Call (302) 475-7594 or schedule an appointment for a free estimate. In most cases, your estimate will be delivered the day we visit. To ensure the most accurate estimate, schedule your free tree removal quote here. In addition to caring for the health of trees on your commercial property and residential tree care, our expert tree surgeons’ knowledge of hazard assessment will ensure the safety of the trees on your grounds. Monitoring and maintaining mature trees in Delaware County should be left to the professional arborists at Brandywine Tree and Shrub. Take advantage of our current tree service specials by calling (302) 475-7594 for a free, no hassle tree removal quote. Tree-Trimming and scheduled tree and shrub maintenance are available throughout our service areas. If you need trusted tree service in Wilmington, Delaware, New Castle County Delaware, Delaware County PA, or Chester County PA, schedule an appointment.